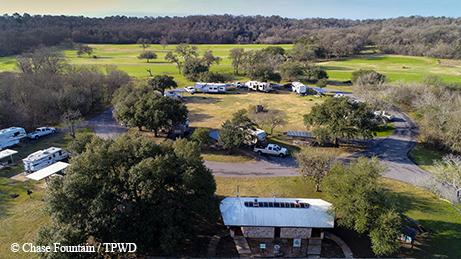 Indulge in daydreams of days past at uncrowded Lockhart State Park. I shout out to the gaggle of students and their entourage, rubbing my chilly hands together to warm them. This home-school history class has come to Lockhart State Park to learn about the past, so we’re traveling back in time together. We start with the Native Americans who lived on the land long ago. To understand their ways of surviving, we take aim at a foam model of a bison with atlatls and darts, then head up the Hilltop Trail to search for edible plants. Here, we stage a mock re-enactment of the Battle of Plum Creek, a conflict between Native Americans and Texans that occurred near the park in 1840. By the time we reach the Creekview Trail, we’ve come back to the 20th century to hear the story of Civilian Conservation Corps Company 3803, which built Lockhart State Park during the 1930s. We spot several CCC-built remnants along the trail. It’s been almost 80 years since the men in the CCC left the area, but you can still see their legacy in the unique features that remain in the park, a short drive southeast of Austin. 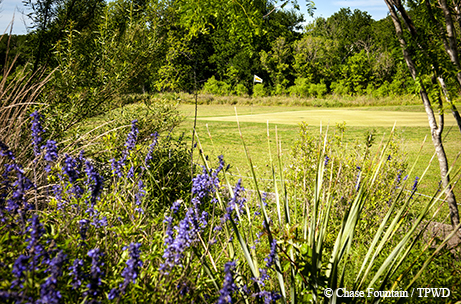 Lockhart State Park boasts the only state-run golf course in Texas, built during the New Deal. It’s also one of the few state parks with a swimming pool, as well as great camping, hiking and fishing. When I ask visitors what makes Lockhart State Park special, they tell me that it’s more than the golf course and swimming pool, or even the natural beauty. As the home-school class discovered, the friendly ghosts of the past enhance your visit. Try visiting midweek fall through spring to have lots of space to let your imagination run wild. Imagine swimming in the old CCC-built pool in the 1950s or swaying on the dance terrace to a 1960s popular tune. Think of special occasions celebrated in the Recreation Hall, or the last spot you camped before the kids started leaving for college. Maybe you have a secret spot at the park that holds special meaning for you. For me it’s the scenic overlook, because this is where I chose to marry. History happens in special places, and memories are made there, too. Travel one mile south of Lockhart on U.S. Highway 183 to FM 20; turn southwest on FM 20 for two miles, then continue one mile south on Park Road 10. For information, call (512) 398-3479 or visit tpwd.texas.gov/lockhart.